Not a very feminine choice? It may not come as a bolt out of the blue, but one of the largest studies yet has proven that men and women really do eat differently. Researchers who questioned more than 14,000 American adults confirmed all the stereotypes: men are far more likely to chomp their way through a plate of meat while women pick at vegetables. While duck, veal and ham featured prominently on the male menu, their female counterparts opted for carrots and tomatoes. There were however a few surprises. Would you have guessed that Brussels sprouts and asparagus were more popular among men? While this research focused exclusively on Americans, several smaller studies from around the world have found the differences hold true across cultural boundaries and also down the generations - with boys and girls as young as five displaying different tastes. One which looked at 23 countries and compared Western countries with the transition states of Eastern Europe and several Asian nations found women overwhelmingly went for what they perceived to be healthier options. But while this may play a role, it is also thought that the rather more negative female preoccupation with body image and counting calories is also a key factor. And there are long-standing cultural perceptions of femininity which die hard. 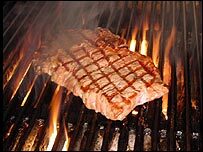 A leafy green salad is perhaps still more likely to win over a large, rare sizzling steak for many women out on a first date. "But I do think this is something that is starting to change as gender relations have changed," says Professor Jane Wardle, director of the Health Behaviour Unit at University College, London. "For older generations there was a very strong perception that meat was for the men, but there are fewer and fewer gender stereotypes attached to burger and chips for instance, which is increasingly seen as a dish for everyone." But it is not more burger and chips that the health campaigners wants us all to be eating, but more fresh fruit and vegetables. Understanding the gender divide when it comes to healthy eating should in principle enable more effective, targeted public health interventions. The UK for instance has heavily promoted the notion of eating five portions of fruit and vegetables a day - and statistics from the Food Standards Agency, in keeping with other findings, suggest that more women than men have heeded that message. However much gender relations may have changed it remains the case that the way to many men's stomachs is via the woman he lives with. Women remain the most likely to be the ones responsible for the household shopping and cooking. And from the health campaigner's perspective, this may be just as well. After all, while every woman in one study answered the question "Which has more fat: a roast chicken leg or fried chicken leg?" correctly, a number of their male counterparts were quite flummoxed.